Topic: New Record game Long Shot. Re: New Record game Long Shot. snakeyes32 wrote: Come on you got to get up to 3540M or 3541M i should say to beat the longest shot on record IRL. Congratz Andhii hell of a shot. Longest Shot in game so far as I know. Bought it, but not much good for anything but flat ground. They all look best in the same place....right beside the green beans, mashed potatoes, and gravy. Topic: heavy recurve vs. traditional recurve power? Re: heavy recurve vs. traditional recurve power? 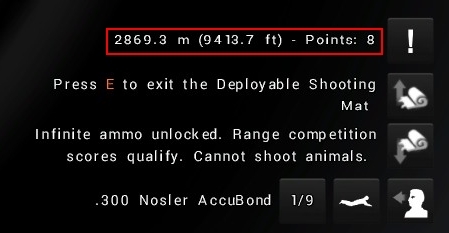 Pretty sad when you can shoot a virtual recurve instinctively eh? The sad part is that no one here believes it can be done with a virtual recurve. You know it can and I know it can because that is the way we shoot it. Re: So long and thanks for all the moose! Dang...I have been hoping, but deep down inside I really knew you would not return. IMHO you will be sorely missed by many besides myself. I wish you the very best in life at everything you choose to do. Just stop by once in a while and say hello. Topic: Did you see the new vehicle stream? Re: Did you see the new vehicle stream? I am failing to understand why a vehicle cannot be deployed anywhere, but requires a lodge or road. Simple, it is a flat ground sight seeing vehicle, which is why they chose Hirschfelden for the Stream.